This editorial appeared in the Special Issue 2016 edition of Tibetan Review. The Sino-Tibetan conflict today is a battle for minds rather than for territory as far as the official Tibetan side is concerned. It is quintessentially a democratic campaign with a very limited scope. That is because whatever opportunities Tibet had to establish its status as an independent country in the 20th century era of international law and interstate institutions was forsaken, missed, or lost forever due to a variety of avoidable as well as unfavourable circumstances. The ignorance and indifference of the pre-1959 Tibet’s ruling class which was interested only to fossilize the country in a medieval time warp despite having repeatedly faced determined Chinese onslaughts designed to annex and integrate it under the very obviously evolving new world order remains a sad chapter in the formerly nominally independent country’s history. The position of the exile Tibetan leadership today is that Tibet as an independent country is a dream that is never going to be realized. And the Dalai Lama, whom Tibetans continue to look up for leadership despite his having irrevocably devolved his historical political role to an elected leadership, has explained that there are much advantages to Tibet remaining a part of an economically strong and globally powerful People’s Republic of China. But the sad truth is that if the dream for an independent Tibet is a wishful thinking, so also seems to be the one for a middle way accommodation with China, which appears to be poised to hold a sixth Tibet Forum Meeting, possibly later this year, to plot an ever further assimilation of the occupied territory. The big question is, will the politically still evolving China be, nevertheless, eventually driven to sit down with the Tibetan side when its economy finally falters seriously enough to stop growing to such extent that it can no longer afford to be the global hegemon that it is today, especially on issues like Tibet, with the Communist Party of China being, likewise, no longer in a position to remain the undisputed ruling clique accountable only to itself rather than to the country’s currently powerless citizenry? Truth, as the Dalai Lama says repeatedly, is a powerful weapon that the Tibetan side possesses and the Chinese side woefully lacks. But the question is whether we have been able to employ truth effectively enough to harvest dividends. Our lack of efforts in building resources in modern academic studies of China is particularly telling. The answer to this question depends on a host of known and unknown factors. But clearly the sooner these questions become current and pressing real-life issues, rather than remaining merely hypothetical conjectures in the realm of academic discourses, the better it is as far as Tibet’s – as well as the Chinese People’s – abiding future is concerned. Powerful arguments, answering ‘yes’ or ‘no’ to issues related to this question, have been advanced by the most informed and learned of people in recent times. In particular, the respected Foreign Affairs journal, published on Apr 30, 2015, carried 32 experts’ views on the proposition that “the current Chinese regime will not survive the next decade without major reform.” The discussions are not only highly illuminating but also show how difficult it is to predict the future when it comes to China not only because of the total secrecy surrounding its leadership issues and internal factional configurations but also the question whether the country will at all find its stability and certainty as a member of the global community of democratic nations in any near future. The role of the academic community committed to researching the truth – rather than distorting the truth to serve a political agenda – is to try to answer these questions by analyzing the current trends and probable future trajectories on the basis of both available information and a multitude of unknown and uncertain factors. In the hope that many more academically aspiring Tibetans may be encouraged to involve in the field of understanding what the Tibet issue is in the context of the larger China issue, this publication joined the Tibet Forum1 of the Jawaharlal Nehru University, New Delhi, to hold a symposium on the late Professor Dawa Norbu on Apr 7. Professor Dawa Norbu had not only set the benchmark for the Tibetan Review as an editorially independent monthly publication but was also, for decades, something of a lone Tibetan voice in the global intellectual mainstream on the issue of Tibet. Those who spoke at the symposium included an assortment of distinguished academics, intellectuals and administrators; they were people who were his former students, colleagues, friends and admirers. Their contributions, taken as a whole, provide a measure of where the Tibet issue stands in the context of its history, the current and evolving world order, and how Tibetans might hone and attune their campaign not only to keep the issue alive and vibrant in today’s possibly worst scenario marked by a phenomenally risen and rising China but also in order to remain prepared when an opportunity might present itself in future developments. More importantly, they show how vital it is that Tibetans build their intellectual and academic resources so that they may gain an incisive understanding of their current political situation and, based on it, chalk out goals, plans, and strategies for the future. This will, in turn, enable them to carry out campaign actions which are designed to achieve them at various levels on the basis of the ground reality and probable future developments instead of being determined by nothing more than pious faith and good intentions. Truth, as the Dalai Lama says repeatedly, is a powerful weapon that the Tibetan side possesses and the Chinese side woefully lacks. But the question is whether we have been able to employ truth effectively enough to harvest dividends. Our lack of efforts in building resources in modern academic studies of China is particularly telling. 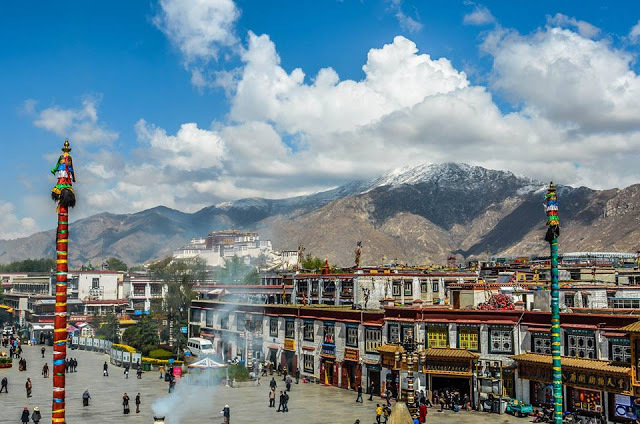 This has greatly hampered our understanding of how the communist party of China determines and implements its Tibet policies, who among the Chinese leaders play decisive roles in shaping and finalizing it, and what arguments and understandings underlie them. 1. Tibet Forum is a collective of young motivated individuals of Tibetan origin who are or were pursuing studies in the vibrant multi-ethnic environment of Jawaharlal Nehru University. This diverse congregation of youth is an ideal forum for articulation and informed discourse on every aspect of the Tibetan Diaspora. Since its inception in March 2004, the forum has organised activities such as discussions, annual seminars, public meetings, book and photo exhibitions and cultural activities. And most important of all, we meet up regularly to discuss and present different issues.